Happy hump day! I feel like each week gets busier and busier and goes by faster. It's time like this where I really have to pause and really focus on the important stuff. I just wrote an article about the "millennial mom" for a company. It has really challenged me and I can't wait to share with you! But, I have to share this dress with you. 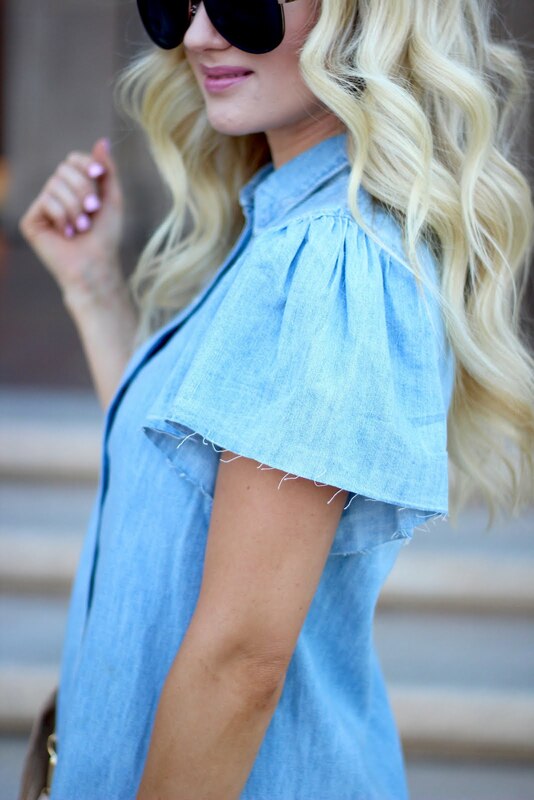 A denim dress is one of those must have pieces that every girl has to have in her closest. I thing that I love the most about denim dresses is there are so many different styles and versions. I just saw one that was a Maxi dress on another blogger friend and it was the cutest thing I ever saw! And I really don't do maxi dresses. Of course my favorite here is the ruffle puff sleeves. It just a little small detail that gives a basic simple dress a feminine kick. I'm obsessed! Stay tuned for updates and posts on all my picks from the Nordstrom Anniversary sale that starts tomorrow! !